I made an MP4 video on my iPhone and when I sent it to my email and saved it in Windows Media Player the MP4 video was upside down. Can I rotate MP4 back in media player? How to fix this problem? Shot a high-quality MP4 video using iPhone but it was filmed sideways on TV? Download a YouTube video on your computer but it is displayed in the wrong orientation? The problem with MP4 video sideways is particularly true when you play iPhone videos on Windows computer. This is because your phone doesn't understand the orientation and Windows product is incompatible with Apple's. As such, you must reorient MP4 video to make it show properly. 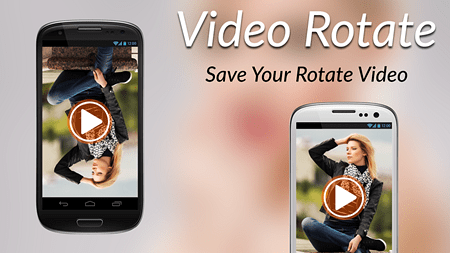 To do this, here we will guide you about how to rotate MP4 effortlessly with a fast and easy MP4 video rotator. 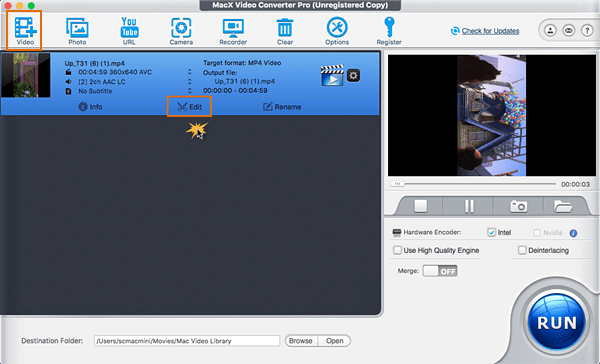 MacX Video Converter Pro is able to fix MP4 video upside down/sideways in a click. It is the best MP4 rotator that can rotate MP4 on Windows and Mac in 90/180/270 degrees and flip MP4 horizontally at lightning speed. What Programs Can Flip or Rotate MP4 Videos? Rotating MP4 video file is the process of making the sideway or upside-down video right way up. Windows Media Player has no option to rotate video currently, but you can still rely on many other tools to get MP4 video rotated upright, such as Windows Movie Maker, VLC, Handbrake, and more. These tools are commonly listed as the top MP4 rotating solutions but produce alike troubles. For example, media players only allow to temporarily rotate MP4 each time you open it. Windows Movie Maker is the most referred to as the MP4 rotator that make videos in vertical or horizontal view, yet it is picky: you must install the latest version, shorten the video duration within a smaller size, ensure to have a proper codec installed on PC, update your video card drivers, and more. While you can enable MP4 rotating with Handbrake, relying on command. This is a little bit complex and hard to remember. Is there a permanent and simple way is to flip or rotate MP4 video frame rate so that it will play right each time you want it? Instead of providing you many dizzy choices for mp4 rotation but with complex process to fix video upside down or sideways, here we just share the easiest one that can do MP4 rotation as childsplay. 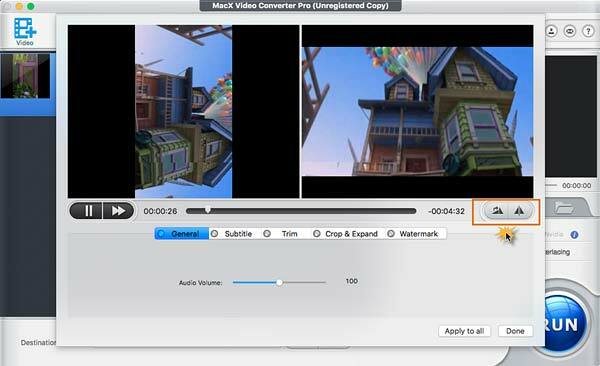 That is MacX Video Converter Pro , the top-end software for rotating MP4 videos in 90°/180°/270° and flipping MP4 videos horizontally, which makes the sideways MP4, AVI, WMV and other videos oriented correctly in an easy way. 1. One click rotate MP4 video clockwise in 90/180/270 degrees as well as flip video horizontally at high speed. 2. Support as many as 370 audio/video codecs, that means you can also rotate videos in MOV, AVI, MKV, WMV, MTS, HEVC and other videos with a click. 3. Provide powerful video editing features like trim, crop, merge, compress, watermark, add subtitles, etc. 4. Built in video transcode engine that allows you to re-encode MP4 before rotating and convert MP4 to MOV, AVI, WMV, MKV, and more. 5. Infused with 400+ readymade profiles so that you can convert MP4 video for sharing and playing on TV, YouTube, Facebook, iPhone, PSP, PC, Mac, and more in right orientation. Prior to the steps of rotating MP4 video file, please get the MP4 video rotating software installed and run on your respective OS. Step 1: Click Add Video to load MP4 video to be rotated or simply drag & drop MP4 to the window. You can add more than one MP4 video for rotating at a time. Step 2: Afterwards, you will be informed with a pop-up window for you to choose the output format you want convert MP4 to, ignore the window by click Done button, if you don't want any re-encoding. Step 3: Click Edit on the main interface to trigger the video editing feature. On the right side, click the button to rotate MP4 90 degrees, 180 degrees or 270 degrees. You can also tap the button next to it to flip MP4 horizontally. Step 4: Click RUN to begin MP4 video rotation on your computer. It will take only a few seconds, depending on your file size. 1. You can kick off the profiles window, which allows you to rotate MP4 and upload to YouTube or so, play on mobile devices, and more. 2. Click "Subtitle" allows you to select the inner/hard subs, and even add external subtitles to MP4. 3. The Trim button aids you to trim out the unwanted parts like ads while leaving the favorite segments of MP4. 4. Crop & Expand is helpful when you need to get rid of the black bars, set the aspect ratio to fit your device screen. 5. You can even watermark the video to be personalized by click the Watermark. If you found your iPhone MP4 videos are displayed in wrong orientation on PC or others, there is another easy to fix iPhone video sideways. MacX MediaTrans is another great tool that aids you to automatically rotate MP4 video at times you load the file. It is known for data transfer. The MP4 rotator makes it easy to transfer MP4 video, music, movies, TV shows, audiobooks, and even iTunes movies between iPhone iPad and computer and automatically rotate and convert the files to be readable by your device. On top of that, the file size will be reduced up to 50%, thus greatly ensure proper storage on your iDevice. You can free download the MP4 rotating and transferring software and put MP4 videos on computer in the right direction with ease.